The Metropolitan Museum of Art in New York is one of the world’s largest and finest museums, with over two million works of art spanning five thousand years of world culture. The museum was founded in 1870 by a group of American businessmen, financiers, and leading artists and thinkers who wanted to create a museum to bring art and education to the American people. After amassing a small collection of Old Master paintings, the museum opened its first exhibition space in the Dodworth Building, a former dance academy and private residence in midtown Manhattan. The first artworks collected by the museum were largely gifted and donated by its founders and notable collectors. Henry G. Marquand was a prominent businessman who made his fortune in real estate, banking, and railroads. He was an important financier for the museum, serving as trustee and treasurer before becoming the museum’s second president from 1889-1902. Marquand had an impressive collection of European paintings and Delftware objects that he generously gifted to the museum. His donation of Delftware makes a substantial proportion of the museum’s collection. 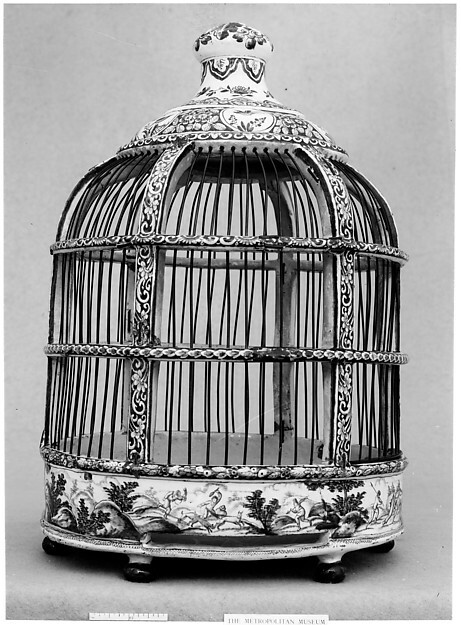 One of the most outstanding objects donated by Marquand is an extremely rare bird cage, donated in 1894. Another museum highlight, acquired in 1994, is a magnificent tulip vase that measures 72.4 cm high. It is marked for Adrianus Kocx, the owner of De Grieksche A (The Greek A) factory from 1686 to 1701, and was designed by Daniel Marot, the architect of the Dutch stadtholder William of Orange and his wife Princess Mary Stuart.